Each year, I secretly love when I get to teach transformations because I not only enjoy teaching them but I love seeing the LIGHT in student’s eyes when they finally grasp on to what they are or they are able to teach a classmate. Seriously the best part of teaching. 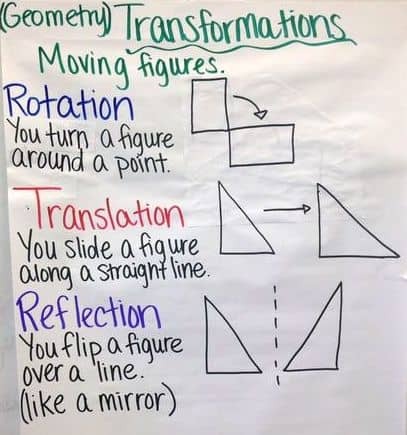 If your students are anything like mine they seem to get each of the different types of transformations (rotation, reflection, and translation) confused from time to time. Many of use very popular visual devices for our students to remember what happens in each type of transformation. 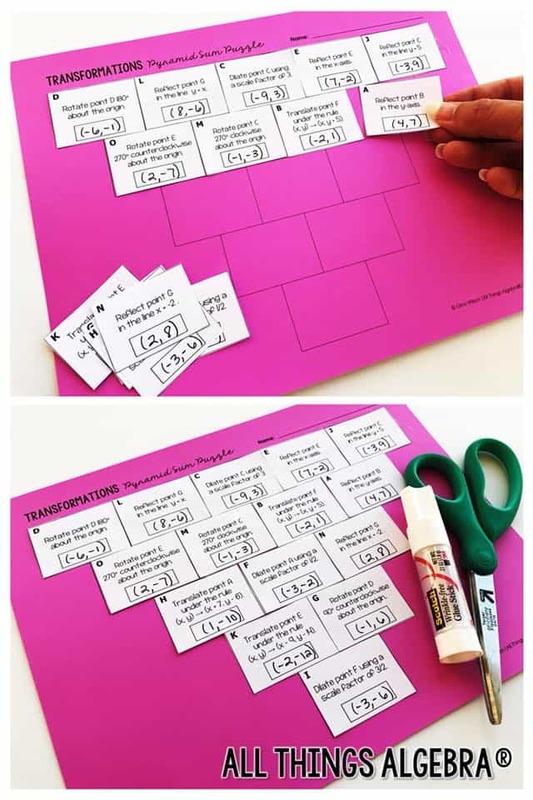 While this is a great way to help our students understand transformations, they don’t always remember them so we have to SHOW them each of the transformations. Over the course of the past few years, I have been using a flippable in our Interactive Notebooks very similar to my latest version. While it is important for my students to take notes, I also want them to have something to reference as well. As you can see, we start with identifying our objective and writing down our reminders from the visual devices they have learned over the past several years. Once we have done this, we go on to defining each of the types of transformations under the flap, this is the boring part for sure. 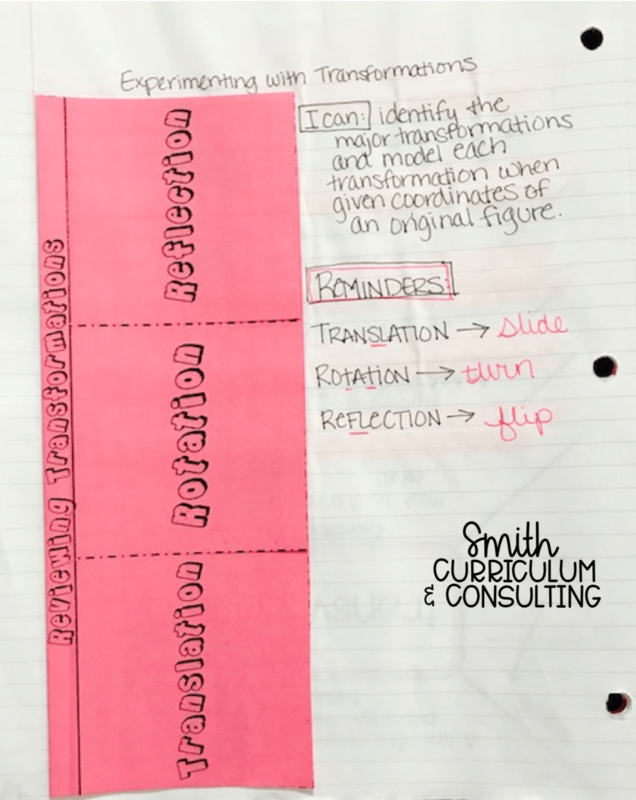 Students glue down their slip of graph paper and mark off each of the three sections be able to create examples for each of the transformations. While I am walking around the guide students, I allow them to make each of their own examples. They first mark them with pencil prior to drawing them out so that they can correct any mistakes before having them set in stone. 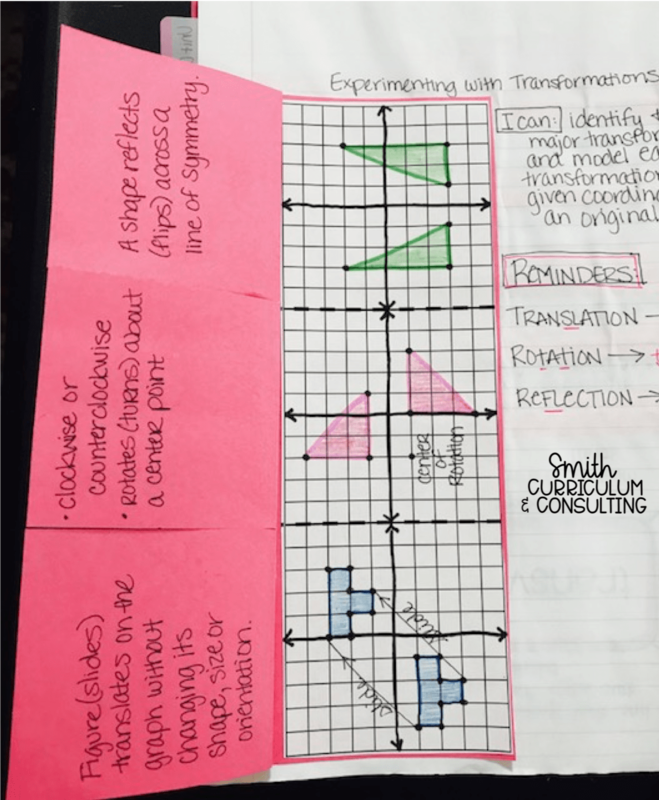 Another method for reviewing transformations would be using Doodle Notes in your interactive notebooks. This set of Doodle Notes by Math Giraffe would be a fun activity but also a great way to diversify how you are teaching in the classroom. Not only students learn in the same way and this would definitely allow for that. Working in hands-on ways to with Transformations is key to having our students understanding them. One of the super fun ways that I found to do this is by super fun Rotation Rules activity by Managing and Motivating Math Minds. 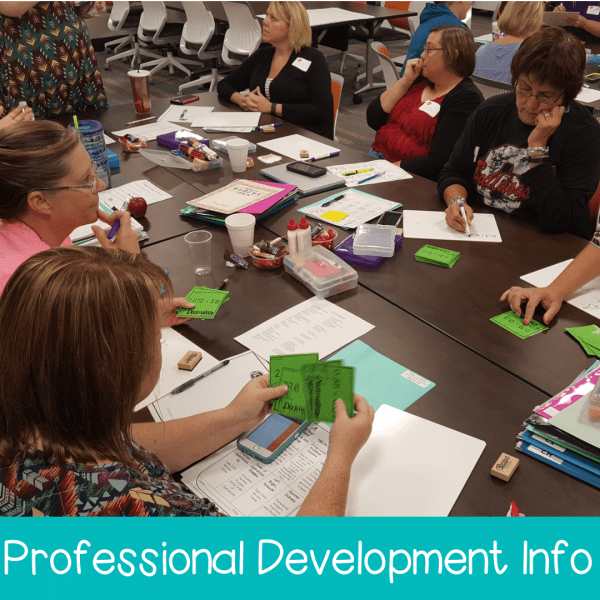 Seriously SO FUN and easy to prep and have ready for your students. 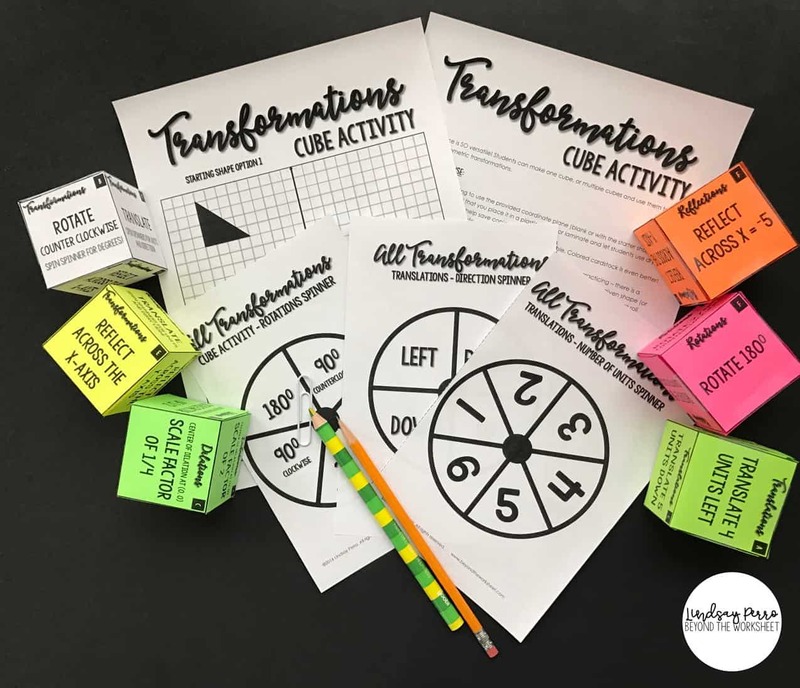 Another great activity, especially for group work, would be the Transformations Cube Activity by Lindsey Perro. Students can practice individual transformations using the individual cubes or multiple transformations using a combination of the individual cubes or one of the two “all transformations” cubes. 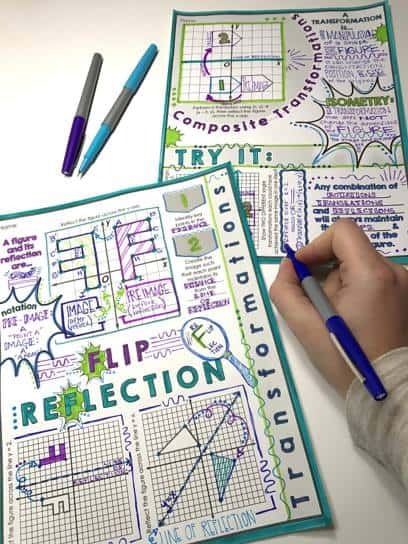 And if you are looking for a great project for your students to work on independently or in groups, this Geometric Transformations Project on Analyzing Logos by Mrs. E Teaches Math is another great one. Students create a slide show by pull in popular logos and describes how each of them relates to transformations. 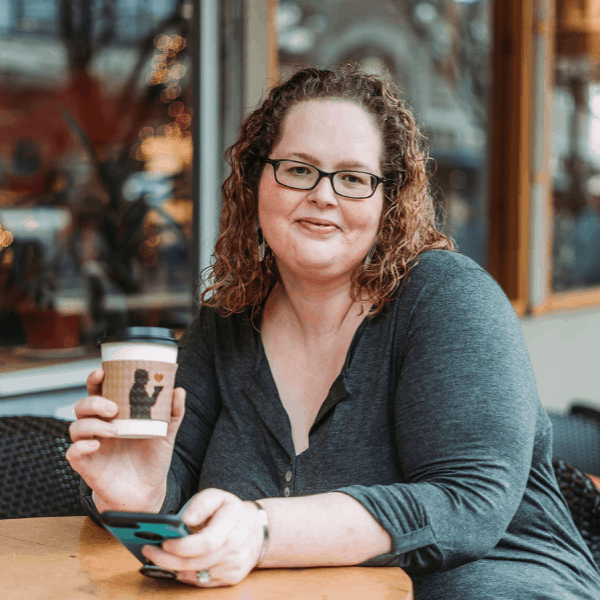 She has some popular examples on her blog but this is sure to be a fun one! And finally, once students are ready to practice a little more on their own, this Transformations Pyramid Sum Puzzle is sure to please! Students are given fifteen problems that they must solve by identifying the coordinates of the point under the given transformation. Then, they paste the problems onto the pyramid so that each solution is the sum of the x-coordinates and y-coordinates directly above it. 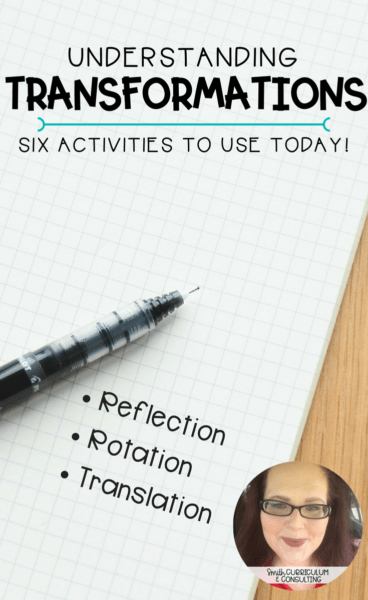 WHICH OF THESE ACTIVITIES ARE YOU PLANNING TO USE TO TEACH, PRACTICE AND/OR EXTEND TRANSFORMATIONS IN YOUR CLASSROOM THIS YEAR?